Looking for a Level 2 Food Hygiene and Safety Course? A level 2 food hygiene & food safety is a legal requirement for food workers who deal with producing, preparing, transporting or serving food. Our food hygiene certificate level 2 course is Approved by City & Guilds and available to take online and complete today. We offer courses in catering, retail and manufacturing to national industry standard. Each meets UK & EU requirements for food-handlers. They allow the learner to train at their own pace with the course being on average approximately 2 - 3 hours long to complete. Our level 2 food safety training comes with unlimited free resits. 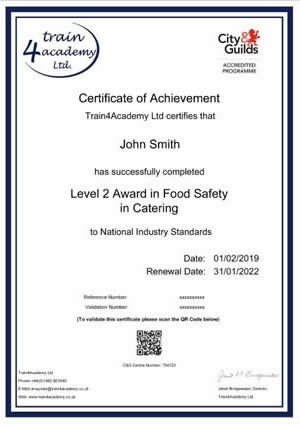 Our food safety level 2 course have been approved by Environmental Health Officers, ensuring the learning content is in accordance to their guidelines. Help to safeguard the health of your customers and the reputation of your business by studying for a food hygiene and safety level 2 certificate online. Not looking for level 2 training? Take a look at our available food hygiene courses. This food hygiene course for the catering industry is suitable for all that are working with foods both raw and ready to eat. This food hygiene course for manufacturing is suitable for those preparing, processing or packaging all food types. This food hygiene course for retail is for individuals who handle food for sale, ready packaged or unwrapped and ready to eat.